The name “PhoneGap” is quite possibly one of the more recognizable names in this space. Originally created by Nitobi, the name was changed to “Apache Cordova” when it was donated to the Apache Software Foundation. Adobe purchased Nitobi – including rights to the PhoneGap name – and now distributes Cordova under that name. Cordova apps install just like a native application, and are able to leverage app store discoverability. Cordova is open source and free, so there are no licensing costs (also a potential weakness, mentioned below). Cordova/PhoneGap solutions existed in this space early on, and have matured to the point where value-add offerings on top of the basic CPT are the norm. For example, both Adobe’s PhoneGap Build and Telerik’s Icenium enable developers to build for supported target platforms in the cloud, without local SDKs (meaning non-Mac users can build iOS applications). In addition to Icenium’s cloud build services, Telerik also provides Kendo UI Mobile (an MVVM framework targeted for performance on mobile), app analytics via EQATEC and a Backend-as-a-Service (BaaS) offering named Everlive. Adobe has integrated PhoneGap Build capabilities into Brackets (a web based IDE) and Dreamweaver. Of course, being free is no guarantee of success. In fact, the emergence of PhoneGap Build and Icenium are clear demonstrations that a “bare bones” Apache Cordova is woefully incomplete. The strength of being open source – and leveraging the talents of a wide array of contributors – is both a blessing and curse. If you need to extend your app with a custom Cordova/PhoneGap plugin, odds are you will find one. Yet it may be out of date and not support the target platforms you need. The plugin architecture works well if you can find the plugins you need or if your web developers are capable of changing gears to write their own custom plugin(s) as needed. However, odds are that you chose Cordova, in part, to avoid the need for specialized native platform skills. The performance of Cordova/PhoneGap apps has often been criticized. Native UI will always outperform a hybrid solution, but improvements in device hardware and WebView implementations have narrowed the gap. Your web developers will need to pay close attention to performance, which means their knowledge of profiling tools as well as which web UI frameworks are mobile-friendly is essential. The use of native UI components is a performance win, and the Alloy framework attempts to normalize UI across platforms. Appcelerator provides value-adds such as a Backend-as-a-Service (BaaS), app analytics and a marketplace for 3rd party components. Developers are required to manage target platform SDKs locally. It’s highly recommended for your team to establish a controlled build environment/CI process if you choose to manage SDKs locally, especially if you target multiple platforms. SDK version & build-related issues can be a horrific time sink, when you really need your team delivering features. Normalizing the UI across platforms, while arguably a “pro”, is also a “con” in that your team will need to train on a proprietary technology to gain skills that are not directly transferrable outside Titanium. Most Flash/ActionScript developers consider the IDE tooling for these technologies as mature. The “elephant in the room” for many mobile developers is the fact that Adobe purchased Nitobi (and the rights to the PhoneGap name), clearly signaling to many that AIR may not be a long term strategy for mobile development. This combined with the rapid decline of Flash erodes the confidence many developers might otherwise have in choosing AIR. Sencha Touch is an HTML5 mobile application framework for building web applications that look and feel like native applications. Apps built with Sencha Touch can be used with Apache Cordova/PhoneGap or Sencha’s native packager – either which will package the application in a native container and enable access to select device-level APIs unavailable to traditional web apps. Sencha have produced a larger quite of interoperable products, from “Sencha Architect” (a visual HTML5 app builder) and “Sencha Touch Charts” (for data visualization) to IDE integration with the Sencha Eclipse Plugin and an secure Enterprise app deployment story with Sencha Space. Sencha Touch offers an MVC style architecture, a library of UI components, an extensible API and UI themes among other features. Native packaging is possible via Apache Cordova/PhoneGap or Sencha’s SDK. Extending a Sencha Touch app with access to additional native APIs will likely involve writing custom Apache Cordova/PhoneGap plugins. This will require specialized platform skills (or training to acquire them). Qt provides a substantial set of libraries containing intuitive APIs for things like threading, networking, animations and more. Qt’s IDE tooling (Qt Creator IDE & Qt Designer) appear to be solid development tools, and code profiling is available in QML Profiler. Qt Linguist enables translation and internationalization in applications – giving you the support of multiple languages within your app (in a single binary). 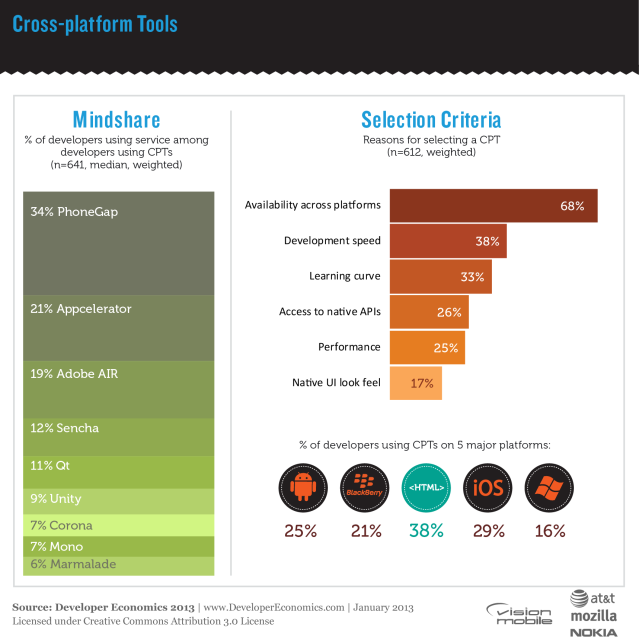 Developers most often use several cross-platform tools; on average CPT developers will use 1.91 CPTs, confirming the lack of maturity and niche nature of cross platform tools ￼much like we observed in our dedicated CPT survey just over a year ago. Moreover, we found that one in four developers will use more than three cross platform tools. What CPT(s) do you plan to investigate or adopt? Check out the full list of CPTs we’ve identified.